Egyéb információ. Pegson 1165/xr400 Jaws for sale, New/Unused, Genuine Pegson parts. Will fit Pegson 1165 and xr400 machines. New Jaws at excellent price, Special offers for package deals on Jaws, Blow Bars and other wear parts. Transport or Shippping can be arranged worldwide. Please inquire for more photos and details on all Jaws in stock. Only €5,000 per set. Selection of new Jaws, Cheekplates + all wearing parts always in stock to suit all models of Jaw crushers, Please enquiry for pricing. For more information on these jaws and all other machinery available in stock please contact us. View the YouTube video of the Pegson Jaws in our yard here at Ballytrain Plant by viewing our Youtube Channel. A Mascus Magyarország kínálata Pegson 1165/xr400 Jaws €5,000 törőgépek. 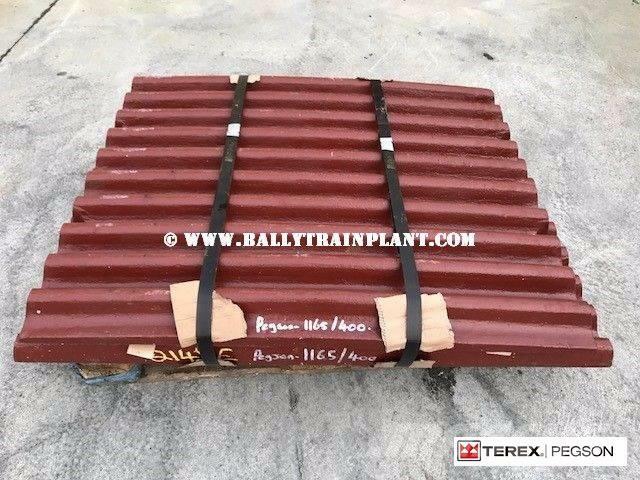 Ennek a Pegson 1165/xr400 Jaws €5,000 az ára 1 599 414 Ft és a gyártási éve 2018. Az eszköz értékesítési helye, - Egyesült Királyság. A Mascus.hu oldalon talál Pegson 1165/xr400 Jaws €5,000 eszközöket és egyéb törőgépek modellt.